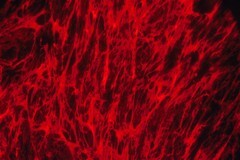 Fluorescent-labeled fibronectin is seen on the surface of a single cell. Fibronectin (a protein glue) often disappears when cells become cancerous. The fibronectins appears red.